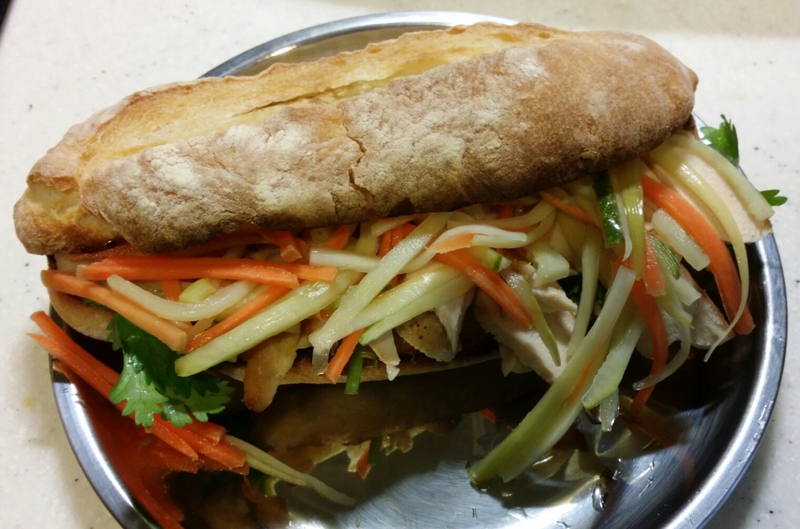 One of my favourite things when eating out is the Vietnamese Chicken Bahn Mi. It’s a light, crunchy baguette style loaf filled with lots of pickled vegetables, grilled chicken and fresh herbs. The Bahn Mi is incredibly tasty and explodes with flavours, unfortunately it also hits the wallet pretty hard. If we have this a couple of times a week, we’re paying close to $100 per week just for sandwiches. I figured I’d try my hand at making them at home and it really wasn’t difficult. The end result was so worth the effort, I’ll be making these sandwiches very often! I’ve broken down the steps below, hopefully you won’t be put off by the procedure. There are a couple of short cuts you can take. So don’t stress! Mix chicken with soy sauce, Maggi seasoning, ginger garlic paste and lime juice. Allow to marinade for at least 30 minutes. Please chicken bone side down. Bake in a pre-heated oven at 180 degrees for 25 minutes. Switch oven to a high grill. Flip chicken breasts. Sprinkle a pinch of sugar and some black pepper on top of bone. Grill for 5 minutes. Flip chicken again and sprinkle sugar and black pepper on top. Grill for 5 minutes. Once chicken is cooked through, remove and allow to cool. Place in the fridge for a couple of hours to firm up. *If using store bought roast chicken, allow to cool and then place in fridge to firm up. Once firm, remove bone and slice each chicken breast thinly. I used this recipe, but doubled it and made a few minor changes. Place water and sugar into the pan of a bread maker machine. Add flour and yeast. Finally add salt. Set to dough cycle. Once bread dough has risen, remove from pan and punch down. Split into 6 equal portions and form smooth balls. Cover with a tea towel and allow to rise again. After 45 minutes, punch each dough ball down and flatten to form a tear drop shape. Start rolling the ‘smaller’ end towards the larger end so you that you form a small log. 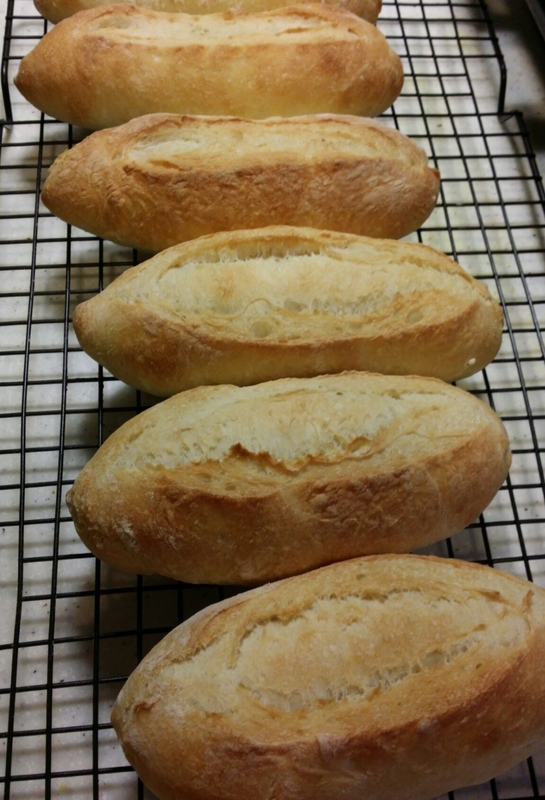 Pinch both ends and pull gently to form a baguette shape. Place on grease proof paper and allow to rise again. At this stage, pre-heat oven and baking trays at 230 degrees. Once the oven is hot, place a tray of water in the bottom of the oven. Arrange loaves on preheated trays. Using a sharp knife, slash down the middle of each loaf. Bake for 8 minutes. After 8 minutes, turn the tray around. At this stage, I also threw in some ice cubes into the back of the oven to form extra steam. Bake again for 10 minutes. After 10 minutes, turn tray around for the final time, again throw some ice cubes in. Bake for approximately 10 minutes, but watch that the loaves don’t burn. Once golden, remove and allow to cool completely. To prepare loaves for Bahn Mi, Slice loaves in half and remove the insides of each loaf. You just want the crust to form a ‘boat’. Save the bits that you pull out to make breadcrumbs. Slice celery, carrot and cucumber to form very thin matchsticks. Mix salt and allow to sit for about 10 minutes. After 10 minutes, rinse vegetables twice and drain well. In a small sauce pan, heat water, vinegar, Mirin and sugar until sugar dissolves. Pour this mixture over the vegetables. Allow to cool and then place in fridge for at least an hour. Spread mayonnaise evenly on the insides of each loaf. Drizzle a little Maggi Seasoning over the mayonnaise. Place loaves under a grill until golden brown. To build each Bahn Mi, spread some coriander leaves in the bottom, sprinkle cut chillies, add a layer of sliced grilled chicken. Add pickled vegetables (without the brining liquid). Drizzle hot chilli sauce on top. Fold over the top half of the loaf and press down. Enjoy!